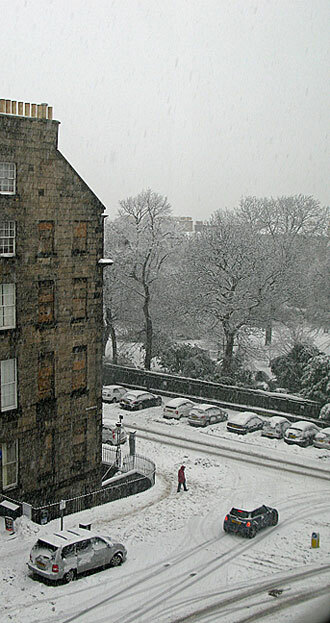 I said last week that winter had come early to Edinburgh. Well, evidently it liked what it saw, because it unpacked its valise, put its feet up on the mantelpiece and settled in for a lengthy stay. Compare the photo at the head of this week’s blog with last week’s – no, it’s not a duplicate, a week on it’s still snowing. Wednesday was the day I was scheduled to have my septoplasty operation. I got up bright and early, with a song in my heart (unfortunately the song was “Highway to Hell” by AC/DC). It was snowing heavily and cars were sliding all over the road outside. Didn’t look promising. I phoned the hospital at 9.00 to see if the operation was still going ahead and was told, sure, why not? I had a cunning plan to get to Livingston – I would take the train, and walk the mile and a half from the station to the hospital. I checked the Waverley Station website, yup, all trains were running. So I fed the huskies and strapped them to the sled, and after a last piece of toast and glass of water with a crack of the whip we were off, into the frozen north. At the station I received my first setback. The line to Livingston was closed, heavy snow, had been all morning – they just hadn’t updated the website. There was a line of about 30 people waiting for taxis, steaming damply, so I joined the queue and steamed along with them. It was only 9.20 and I didn’t have to be there till 11.00. I still had plenty of time, I thought, it’s only 18 miles away. Well, it was a mistake. It took us two goes to get out of the station. Every time we stopped at a traffic light the taxi fish-tailed. The M8 was down to a single lane, the hard shoulder littered with buried vehicles. It was like going for a scenic drive through the Ardennes after the Battle of the Bulge. It was snowing even more heavily in Livingston, where the White Witch had apparently established herself after being ousted from Narnia, the roads flanked by snowdrifts deep as hedgerows. We reached the hospital at 10.45, an hour and 10 minutes to travel 18 miles. I found the ward and was shown into a day room to wait. Where I waited. At noon the shift changed and a new nurse, understandably curious, looked in to find out what I was doing there. Apparently because of the snow they hadn’t been able to discharge the previous day’s patients, so all the beds were occupied. But alas the operation is still to come, when I was hoping it would be but a memory by now. And, with rapidly approaching senility, a distant one at that. 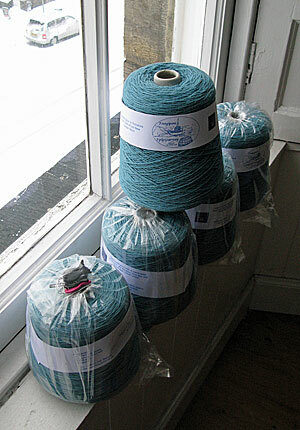 In other news, I ordered the wool for the next gansey from Frangipani, in sea spray colour. The snow has disrupted mail deliveries across the country, but there was a partial let-up over the weekend, so we had the novel experience of a mail delivery on a Sunday. Anyway, thanks to the good people at Frangipani for their usual prompt delivery. I ordered 5 x 500g cones, enough for 2 ganseys. (It’s more economical than buying 3 cones and having 250g left over – so long as you find someone who wants another gansey that colour!). Finally, here’s the final instalment of my novel, in which Scrooge the miser finds out that the spirits have done their work all in one night and it’s still Christmas morning, but Tiny Tim’s been run over by a bus. You can download it as a PDF by clicking here. Are you sure that wasn’t a Canadian hospital you were dealing with? It all sounds terribly familiar to me – and so annoying after psyching up for the procedure. Wishing you well for the future episode; my husband has had it done . . . .! Five cones of Frangipani! I know that the size of my gansey is smaller, but I did the body and one sleeve from only one cone and have so much left on the second cone that I’m not sure what to do with it. The Sea Spray is a lovely color that will be fun to work with. And . . . I am SO ready for Part Three of the Wraiths of Elfael, you left me hanging a bit at the end of Part Two! Thanks for the great read and your creative imagination. Great story, wonderful how the world stops because of a bit of snow. Today I saw a once-in-ten-year sight; a gritter on the road to our village! Not that we haven’t had snow, they just never got around to gritting before. I love the Seaspray – what a gorgeous colour! Yes 5 cones sounds like a lot, doesn’t it? But I average 12-13 100g balls for each pullover (the smallest I’ve ever done was, I think, just over 11 balls). On the body I average 1 x 100g ball every 3.5 inches. But the Sea Spray is great, isn’t it? I’m looking forward to seeing how it knits up. Your comment arrived while I was wrestling with false modesty (and coming a poor second) in replying to Lynne. I glimpsed a rubbish collection truck disappearing down another road today, moving elusively like the creature from Alien escaping into an air duct. That was the closest one’s been to our street for over a week, and the rubbish is piling up. No gritters though… A friend of mine told me he got the kids to kindergarten by dragging a sled through the snow with them on it. Great fun for them, agony for his aching arms!